If you’re planning to pop the question anytime soon and don’t want to invest in a diamond, then this is the place for you. Since DeBeers started their ‘Diamonds Are Forever’ marketing concept in the 1930s, diamonds became the new trend to proposing. While diamonds are insanely sparkly, timeless, and expensive, there are gorgeous diamond alternatives that you can look for. Whether is a colored or clear stone that you want, these alternative stones will steal your heart! Maybe those stones will also inspire you to host a unique wedding ceremony. Garnets are timeless stones. Used widely in antique jewelry to portray timeless elegance, they are typically a rich deep red in color. Garnets are made as a unique blend of different minerals. They look lovely when paired in contrast with pearls or other colored precious gemstones. Sapphires are Katie Jones from Orla James favorite! Sapphires are available in gorgeous colors – blue, green, white, pink, peach, and yellow. Sapphires are the third hardest mineral and make perfect engagement rings. They look gorgeous when set with light colored stones or even as a standalone stone. Amethyst looks mesmerizing when cutting with precision and set in fine jewelry. This graceful lavender stone brings out the beauty of any cut and setting. Pair the Amethyst with rose or white gold to highlight its perfection. While not very hard, amethyst is extremely durable while being cost effective. Like sapphires, rubies are very popular amongst couples. Rubies range in hue from light red to deep blood-red. Great quality rubies are more costly than diamonds! The most expensive rubies are of Burmese origin. In case you opt for a ruby, pay close attention to the cut, clarity, and color – deeper the better! Emeralds are beautiful green in color. Their rich green tone makes them look rich, graceful, and precious, making them a hot favorite for engagement rings. Emeralds have a timeless quality to them and can also be used in heirloom designs with grace and magnificence. Like rubies, look for a deeper green color to offset any light metal. Pearl set rings to look great in all patterns and add a gentle grace to any hand. Pearls have always been considered elegant and timeless. The only issue with pearls is that they require additional upkeep since they scratch easily. Select a pearl set engagement ring only if it won’t be worn very regularly. Topaz stones are available in a dazzling array of colors and hues. They come in colors of red, pink, blue-green, smoky, and yellow! A perfect, pure topaz is colorless and colored topaz stones are a result of imperfections in the stone. If your partner might like the reasoning behind a colored topaz, then this is the stone for you! equal brilliance. Well cut aquamarines are in high demand for their clarity and sparkle! 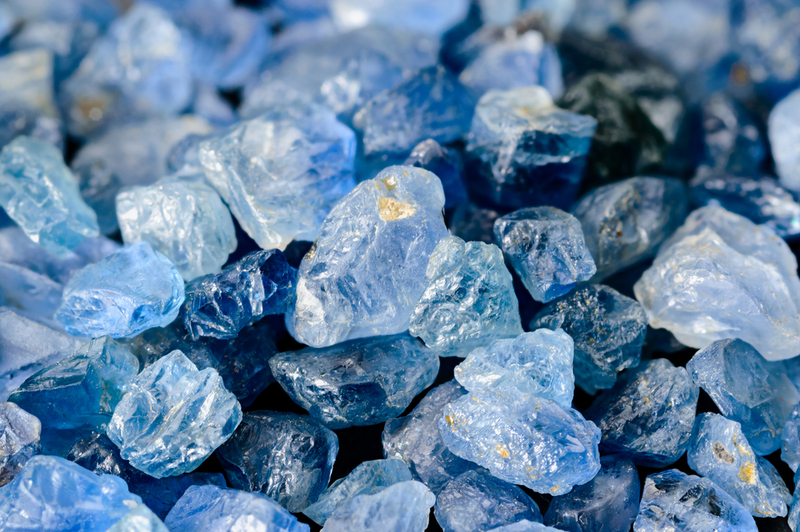 Aquamarines are special since they are also known as ‘lucky stones’ – if you want to bank on that luck with your proposal and wedded life, then this is your perfect stone! Tanzanite was discovered in the latter half of the 1900s in Northern Tanzania. It’s a rare, bluish purple stone that is 1000 times more expensive than diamonds! It is said to be available only for another thirty years since the supply is minimal and demand high. So, if you want to gift your partner the stone of the century, this is it! Trendy and vibrant, the turquoise has been prominent as a leading alternative stone over the years. Turquoise has a composition of aluminum and copper and ranges from bright to pale blue with flecks of visible metal in it. You can pair this trendy stone with smaller colored stones in any choice of metal to give it a luxe matte look! Morganite is a gorgeous, romantic pale pink stone usually set with small diamonds or white colored stones. This is one of the more popular choices for engagement rings currently. Morganite belongs to the emerald family and the cut, size and clarity can vary. If you want to invest in a good Morganite stone, speak to your jeweler to get you the best quality for your stone. No matter the stone, your engagement ring has to be unique and personalized. Select any stone from this list but ensure that your choice is a true reflection of your love for your partner. There’s nothing more beautiful than an engagement ring to make your intentions known to your partner.